This mural was created in coordination with the Burlingame Historical Society. A culmination of 8 months of design work, the mural is located in downtown Burlingame, California. The public art installation is based on the idea of antique postcards of yesteryear. It is comprised of 3,195 ceramic tiles and measures 15 by 47 feet. The design showcases the history of the community while telling the story from past to present. Ten topics of significance were selected to help tell the story of Burlingame, the images inside the letterforms range from early lithographic printing to an oil painting as well as an iPhone image. The project requred multiple print tests on the tiles for color, contrast, resolution and gradations. The mural is located on Hatch Lane, Burlingame. Below the mural is a legend that gives credit and reference to the information above. The letter "I" incorporates an oil painting of eucalyptus trees by Don's twin brother, Ron Donoughe. Worked with local history museum to design a public art mural that was made from 3,195 ceramic tiles. 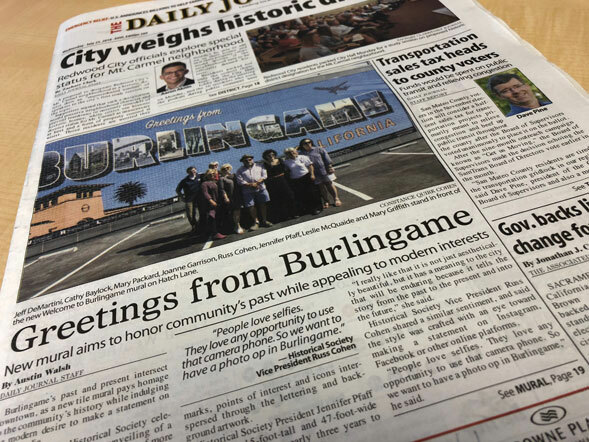 Jennifer Pfaff President of the Burlingame Historical Society It was a pleasure working with Don on the large mural for the Burlingame Historical Society; the exquisite public piece is quickly becoming a "destination" in our city. Don's work displays a great sense of composition with attention to detail, but with a distinctly modern flair.